This great tool is easy to use for creating a strategy. 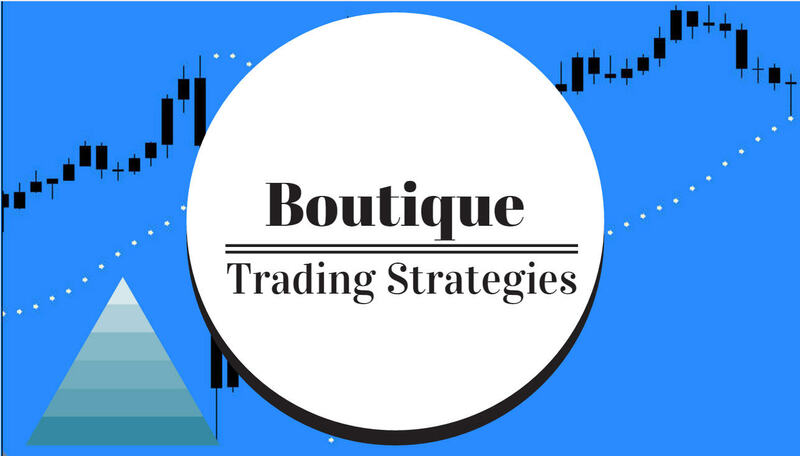 I am going to outline some of the preliminary steps to show how to develop a trading strategy and test for success. Here is the opening screen. 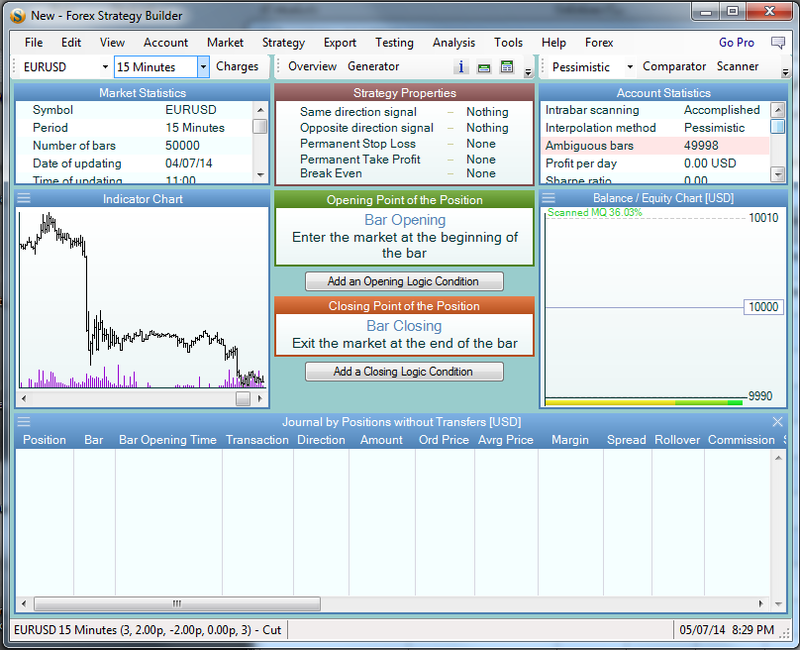 You can see that I have selected EURUSD 15 minutes and 50,000 data bars. We need a good number of bars to ensure that our strategy has some validity. 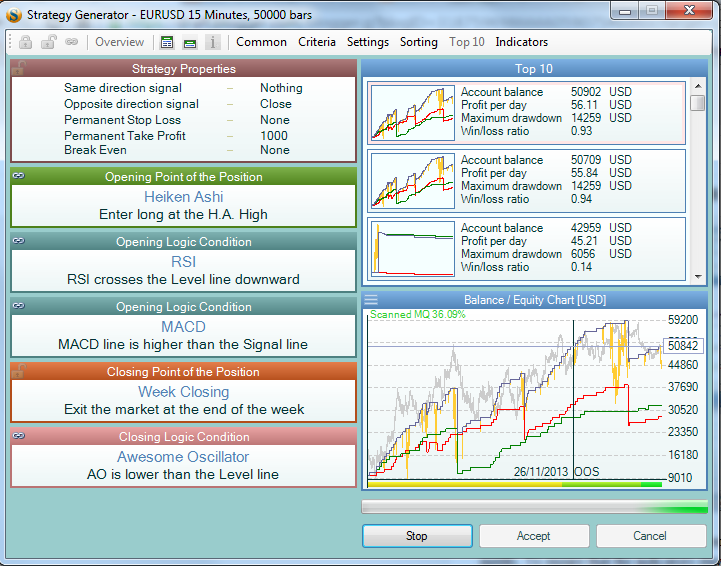 The next step involves selecting an indicator around which to base our strategy. In this instance I will select RSI (for no particular reason). 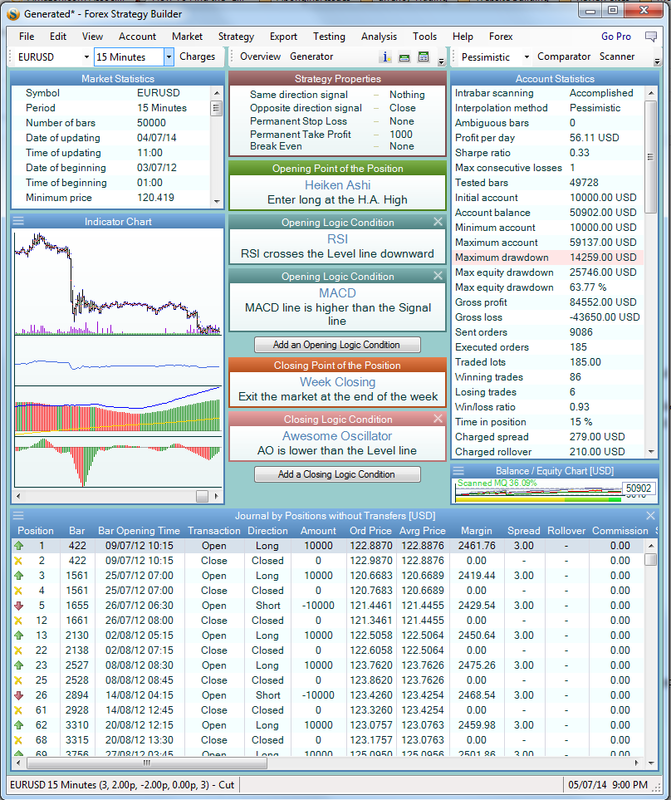 Here is a picture of the indicator selections screen. And here is RSI Selected. 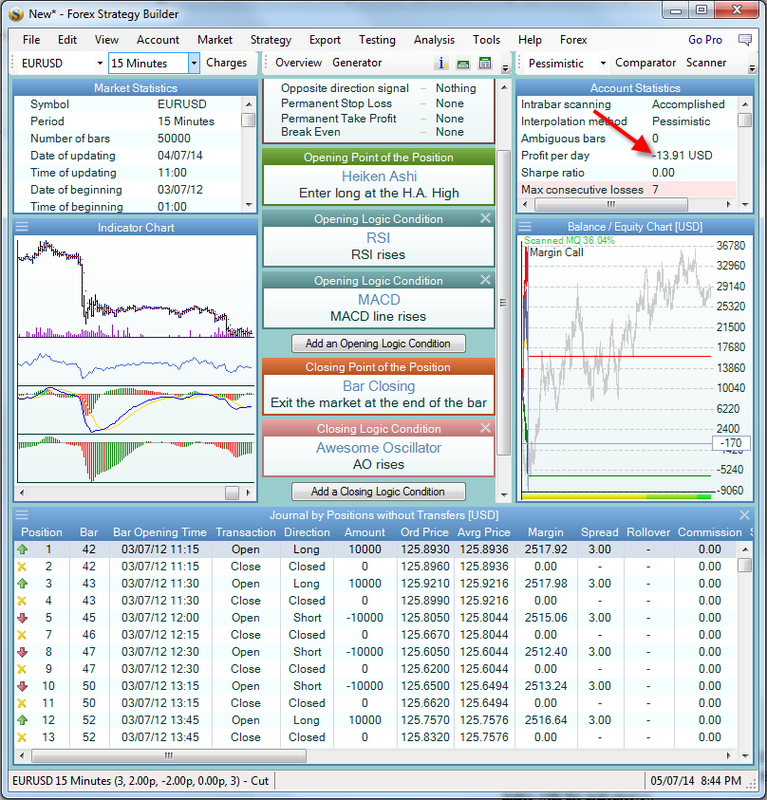 As you can see the journal has already calculated entries based on the aspects of RSI. We will disregard those results for now but it is very interesting to see how the journal will reflect all of the changes we may make with the indicator(s). In the next pic you will see that I have added a Macd and I will also select something for the opening point of the position. For this example I am going to select HeikenAshi.. I will also add something for closing the position. 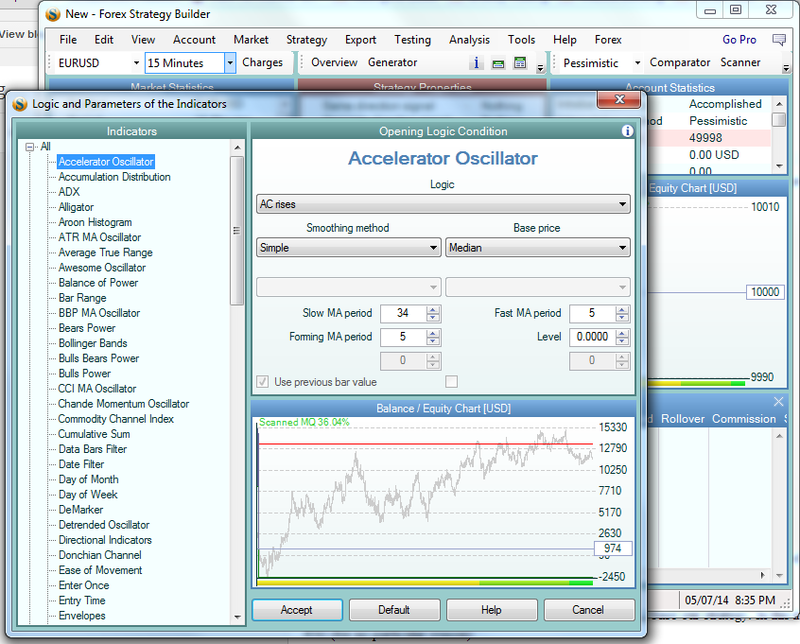 I will use the Awesome Oscillator. 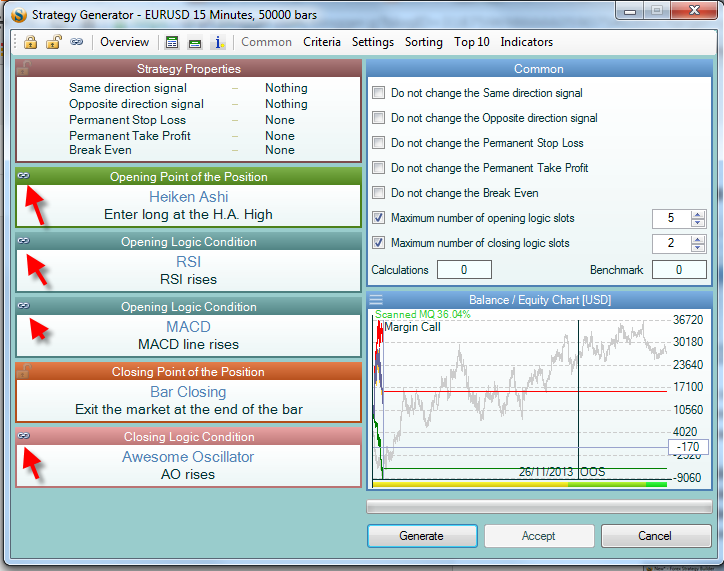 You will see in the pic the indicators that I selected, and, as well, you will see that the loss is about $13.00 per day. I have started the generator and will take a pic of its progress after a few minutes and we can see what it may be showing as a potential strategy. This pic is taken after about 360 iterations and you will see that the strategy is profitable, even though there are three serious losses that have to be investigated and corrected. 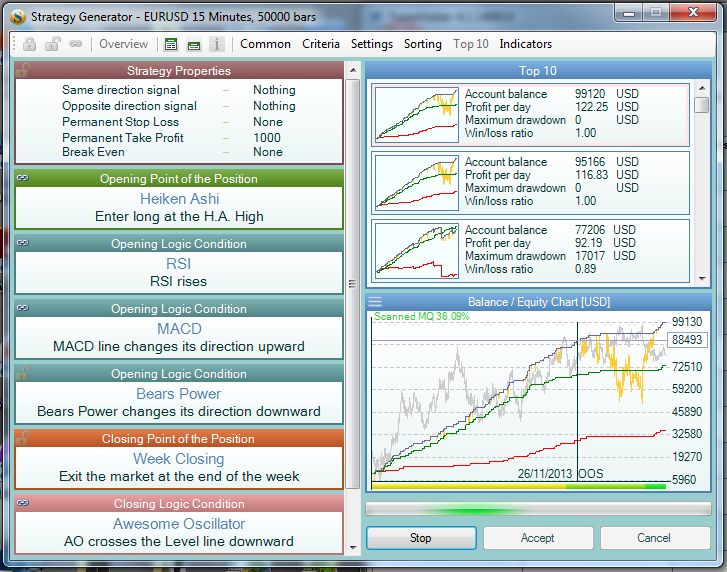 You can see that the generator has tried a Weekly Close and that the daily earnings approach about $56.00 daily. Here is one more pic showing a portion of the journal and also some interesting statistics on the right hand side. 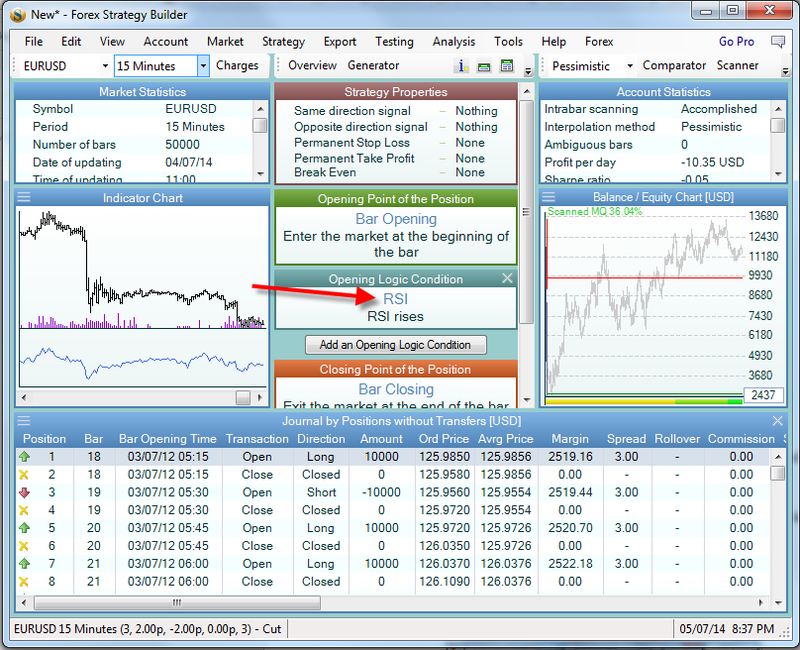 Briefly, this has shown some of the preliminary steps in developing an automated strategy with Forex Strategy Builder. As you have seen, this is very simple software to use and it gives some great results. 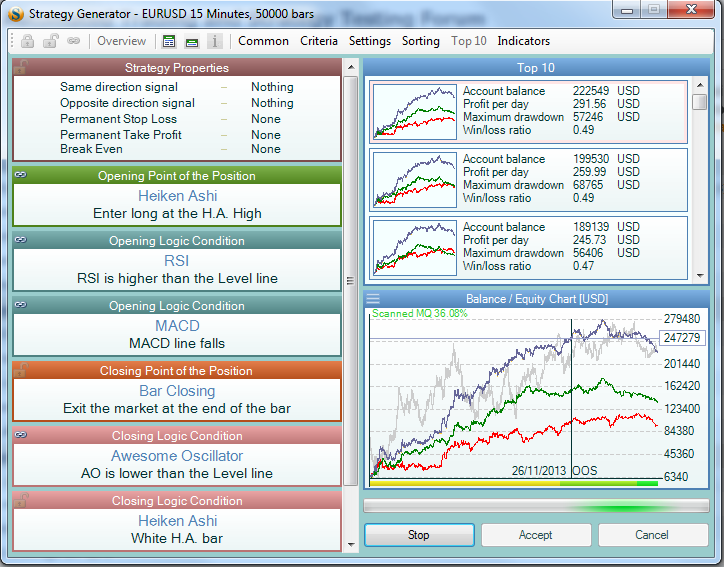 Considering that this is free software, no serious trader can afford to be without it. I did a further optimization, 152 iterations and the profits are much greater as you will see in the pic below. Note also, no losing trades..!! A new result - the generator has done about 650 iterations and now the daily income has increased by a huge amount. Have a look and see that the daily income is close to $300 daily - and we have spent no time at all on coding, in fact, the setup took only a couple minutes and we have a system with great profits.